CLICK ON THE SLIDE SHOW BELOW TO CONTROL IT! Pause, Play, Forward, Reverse, or SKIP! ​Cell membranes are made up of phospholipids. 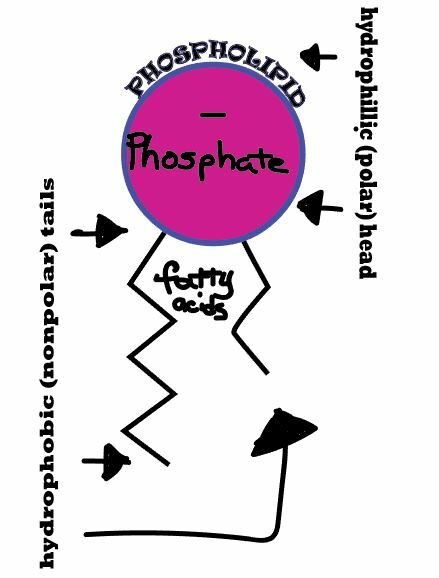 Phospholipids are called amphiphilic, ​because they have a hydrophilic (water-loving) head and hydrophobic (water-fearing) tails. The head consists of a the negatively charges phosphate ion (PO4-) and 2 fatty acid tails that are joined together using a glycerol molecule. 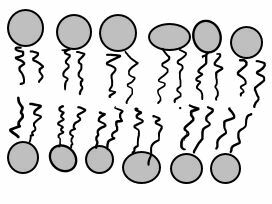 When phospholipids are placed in water, they spontaneously form a lipid bilayer. In this bilayer the fatty acid hydrophobic tails will orient themselves to face one another with the polar phosphate heads facing outward. It is this structure that makes up the membranes of our cells. The function of the membrane is to regulate what comes into the cell and what goes out of the cell. It is for this reason that the concept of osmosis is key for understanding how the cell depends on the microenvironment by which it is surrounded. ​ When we talk about osmosis, we must first understand diffusion. The word diffusion comes from the Latin word for "spreads out". In nature, molecule will behave in such a way to "spread out" from an area of high concentration to an area of low concentration, until a time in which those concentration become equal. At this state, the substance is said to be at equilibrium. it is this phenomenon that is responsible for the air currents and ocean currents, as well as the diffusion of a substance in liquid. Since our cells are in an aqueous environment, we will be looking at this type of diffusion. ​ EXAMPLE: Let's say it is a hot summer day and some kids are enjoying themselves at the local pool. A kid at one end of the pool decides to urinate (pee) into one end of the pool. Initially, the pee will be concentrated at the end of the pool where the pee landed. After some time, that pee will then spread out evenly over the volume of that pool reaching the unsuspecting pool-dwellers at the far end of the pool. In osmosis, we only concern ourselves with the movement of water molecules (H2O) across the cell membrane. As we saw in diffusion, molecules will travel from an area of high concentration to an area of low concentration. To understand this concept, it is important to think about a solution in terms of its components. The liquid substance that acts to dissolve particles, is called the solvent. ​The particles that get dissolved are called the ​solute. ​In biological systems, the solute in unable to freely diffuse across the cell membrane, so it builds up a ​concentration gradient. ​This means that there is a higher concentration of solute on one side of the membrane that there is on the other. The water molecules, on the other hand, CAN move freely across the cell membrane and will travel from an area of high concentration to low concentration. This traveling from high concentration to low concentration can be termed as travelling down its ​concentration gradient. An isotonic solution is a solution that has the "same" concentration of solute to solvent as the intracellular fluid (the fluid inside of the cell). When a cell is placed in an isotonic solution, there is NO NET movement of water into or out of the cell. The cell is happy. ​ A hypotonic ​ solution is one that has "less" concentration of solute to solvent than the intracellular fluid (fluid inside of the cell). 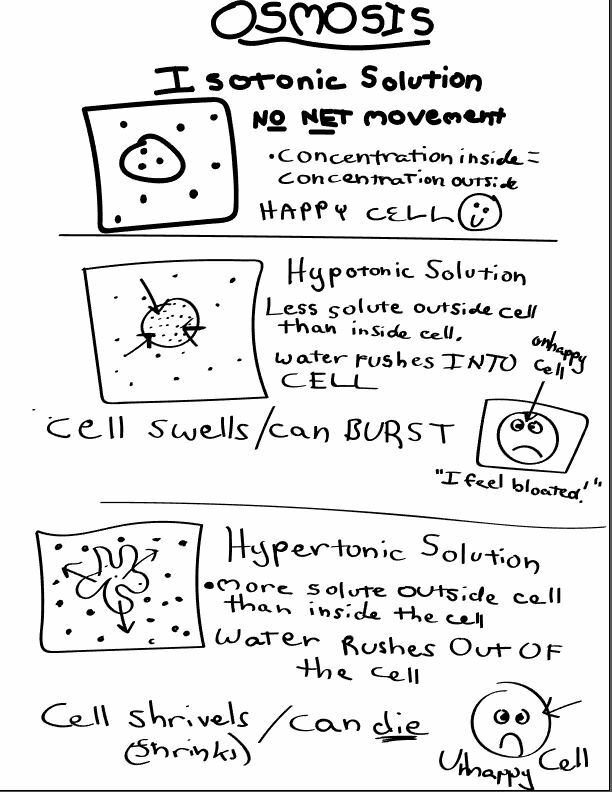 When a cell is placed in a hypotonic solution, water rushed INTO the cell and causes it to SWELL or BURST. ​A hypertonic ​solution is one that contains a higher concentration of solute to solvent than the fluid inside of the cell. When a cell is placed in a hypertonic solution, water will rush out of the cell, causing it to shrink. The dialysis tubing is a semi-permeable membrane tubing used in separation techniques and demonstration of diffusion, osmosis, and movement of molecules across a restrictive membrane. It separates dissolved substances of different molecular sizes in a solution, and some of the substances may readily pass through the pores of the membrane while others are excluded. The dialysis tubing is made up of cellulose fibers. This is shaped in a flat tube. In this experiment, the selective permeability of dialysis tubing to glucose, starch and iodine (potassium iodide) will be tested. This experiment consists of two tests; the test for starch and the test for reducing sugar. When iodine (potassium iodide) is added to a solution in which starch is present, the solution turns blue-black or purple otherwise it remains yellow-amber. When Benedict’s reagent is added to a solution in which reducing sugar is present and it is heated in a water bath, the solution turns green, yellow, orange, red, and then brick red or brown (with high concentration of sugar present). Otherwise, the solution remains blue. Will glucose, starch and iodine (potassium iodide) readily pass through the pores of the dialysis tubing? Glucose, starch and iodine (potassium iodide) will readily pass through the membrane of the dialysis tubing. The solution in the bag and the beaker will both turn blue-black due to the presence of iodine and starch; the presence of glucose in the bag and beaker will be investigated using Benedict test. 1) Add 250 mL or water to a beaker and add Iodine (Potassium Iodide) solution to the water until it is visibly yellow-amber in color. Record the color of the solution. ​2) Next, soak the dialysis tubing in water until it begins to open up. Fold and clip one end of the tubing so that no solution can go through. 3) Leave the other end of the tubing open so that it forms a bag. Add4ml of glucose and 3ml of starch into it. Close the bag and mix the contents. Record the color of the solution. 4) Rinse the bag with tap water and place the bag into the beaker. Hang the other end of the bag over the edge of the beaker. 5) Wait 30 minutes. Carefully remove the bag and place in a dry beaker. Record the final color of the solution. 6) Benedict test will then be done to test for the presence of sugar in the solution in the bag, beaker and tap water (serves as control). a) 3 test tubes were labelled control, bag and beaker. b) 2 ml of water was added to the control test tube. 2 ml of the bag solution was added to the bag test tube and 2 ml of the beaker solution was added to the beaker test tube. c) 2 ml of Benedict’s reagent was added to each test tube and was suspended in a boiling water bath for 10 minutes. The color change was recorded.